OziFresh - Proudly Australian owned and operated since its establishment in 1984, Ozifresh has been an industry leader in odour control and washroom hygiene. 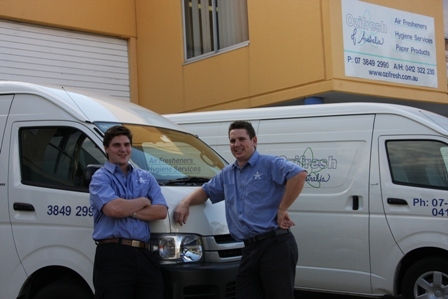 Proudly Australian owned and operated since its establishment in 1984, Ozifresh has been an industry leader in odour control and washroom hygiene. We are proud to supply a comprehensive range of high quality services and products at an economical rate. Ozifresh's outstanding reputation within the hygiene industry is based on specialist service, quality and reliability. All staff are professionally trained and experienced in using the latest washroom technology and products. Its never been easier to control odour in your business environment with Ozifresh's comprehensive service system. Ozifresh's abundant line of washroom hygiene technology and service offers a personal selection to complement any business environment. With major offices in Brisbane, Gold Coast and Melbourne, Ozifresh's covers Australia wide, with particular strength down the eastern coast. We have the capability of providing a high level of service for all situations, no matter what size. No job is too big or too small, we guarantee satisfaction with service that is second to none. We specialise in sanitary disposal (sanitary bins and nappy bins) and air fresheners, but we have the products to cover all your hygiene requirements.